While Japanese pacifism is usually seen as a national policy or an ideology rooted in the provision of Article 9 of the Japanese Constitution, it cannot be adequately understood without grasping Japanese social discourses on peace, war and justice. The perspective of political sociology provides a more in-depth understanding of Japanese pacifism and helps us to find the reasons for the critical changes that have occurred in Japan’s policies since the mid-2000s. These changes include sending its self-defense force to Iraq and Afghanistan outside UN missions and the enactment of new security legislation in 2015. 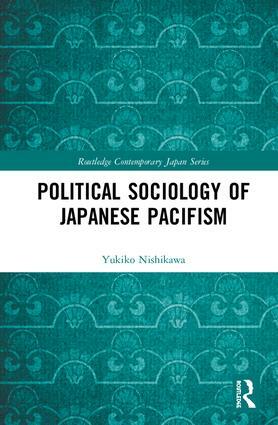 Nishikawa explores Japanese pacifism in a changing domestic and regional context, from the perspective of political sociology. Getting to grips with the social bases of politics, she examines whether Japan is likely to remain a pacifist country or retain its pacifist image in changing regional and global context. This book comprehensively examines Japanese pacifism by fully examining the social forces in action. Employing a multidisciplinary approach, the book contributes to theoretical debates on political sociology as well as Japanese and Asian studies. Japan is in an important transitional period and Japanese pacifism is being brought into question in changing national and international contexts.